Marrying my best friend was the most wonderful experience of my life! I was told by many I was “crazy” when I spent a year hand crafting most of my wedding. I used DIY to it’s fullest potential creating my own invitations, table and menu cards, and many of the decorations. I created over 500 paper rosettes to go on well… everything. 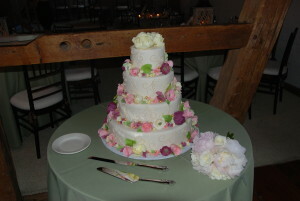 In addition I wanted to make our day super special so I hand crafted 500 sugar flowers and leaves for our wedding cake. For the cake, I worked with my favorite pastry chef that not only made all of my cakes growing up but also is an inspiration to me. Heather Luse, owner of Delectable Delights, baked and constructed the cake and also placed the flowers I created. It was everything we had hoped for and also delicious. It was white cake with a raspberry and white chocolate buttercream filling. The flowers were a great learning experience for me. I had gotten a certification in sugar flowers from the French Culinary School in NYC but this was a great opportunity to make several of the flowers I had learned in class and also use those techniques to try several others! I had peonies and peony buds, roses, sweet peas, rananculus, more flower buds, some decorative gold balls, and lots of leaves. I have enjoyed learning about sugar flowers, expanding my craft and making sugar flowers ever since! Sugar flower work takes patience and took me about 3 months to create these flowers but it is a rewarding experience when you can create something so beautiful.